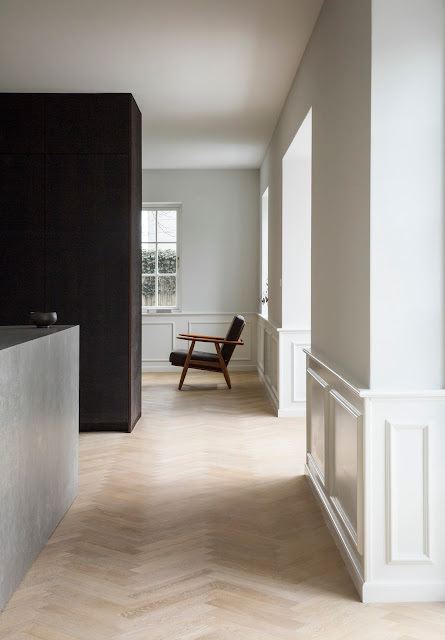 Belgian interior and furniture designers Minus redesigned an existing villa in Keerbergen by altering its interior structure thoroughly based on a timeless, minimalist approach. An existing, grand villa was thoroughly redecorated by Minus. The existing volumes were preserved. A small extension was added, which forms a central refuge in the garden. 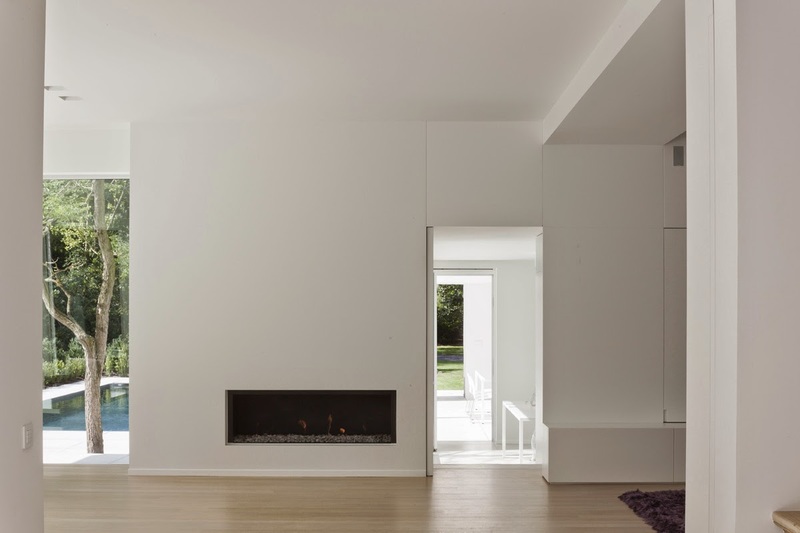 The interior structure was altered severely: the residence underwent a true metamorphosis. The former garages were transformed into a covered terrace and office. The large terraces are a continuation of the interior spaces. A wide, central axis was installed. This creates views throughout the different spaces and the swimming pool is visible from every room. 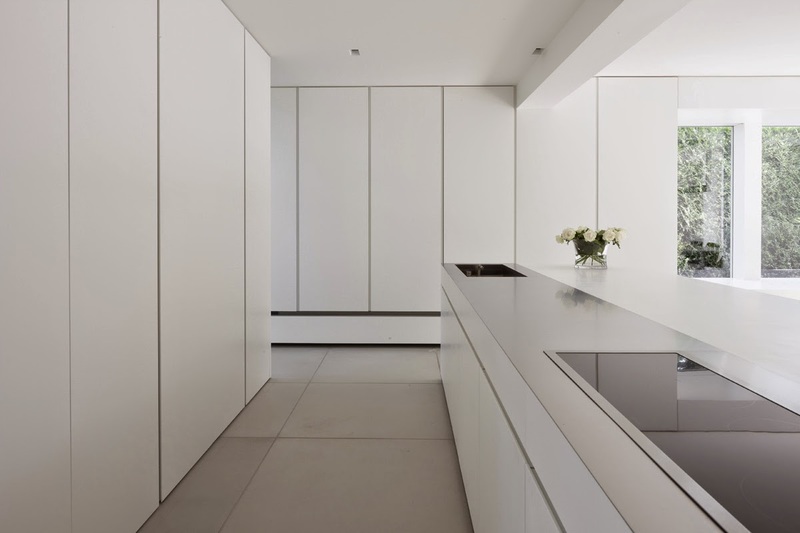 The white façade harmonizes with the matte finish on the walls and cupboards: this blurs the boundary between indoors and outdoors. 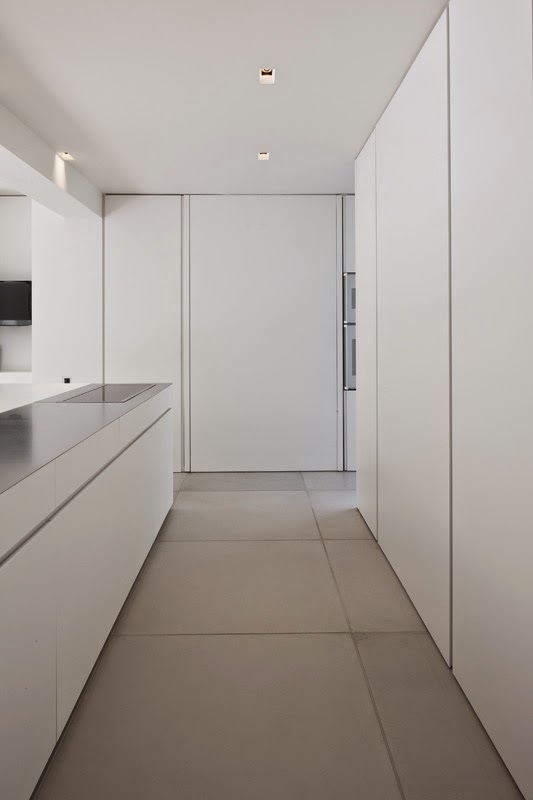 Large, floor-to-ceiling sliding doors were integrated everywhere. An open plan is easily transformed into completely closed spaces. An austere, linear plan required sober and uniform materials: the same large grey concrete tiles were applied everywhere, both inside and outside. 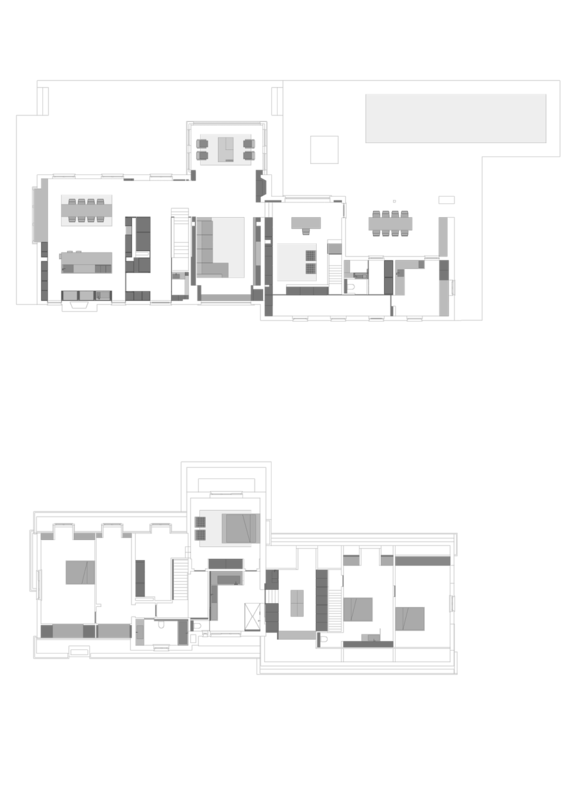 The dimensions of the tiles were adjusted to the architecture. A few dark accents were added in the kitchen and living room: dark zebrano wood and stainless steel contrast with the Corian worktop and the painted walls. 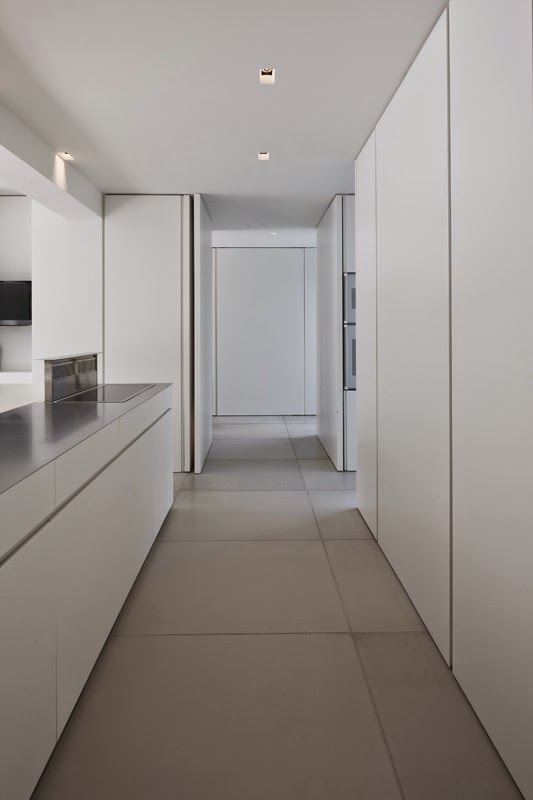 The same colour palette was used on the upper floor with a white epoxy floor. The accent is a brightly coloured piece of furniture. 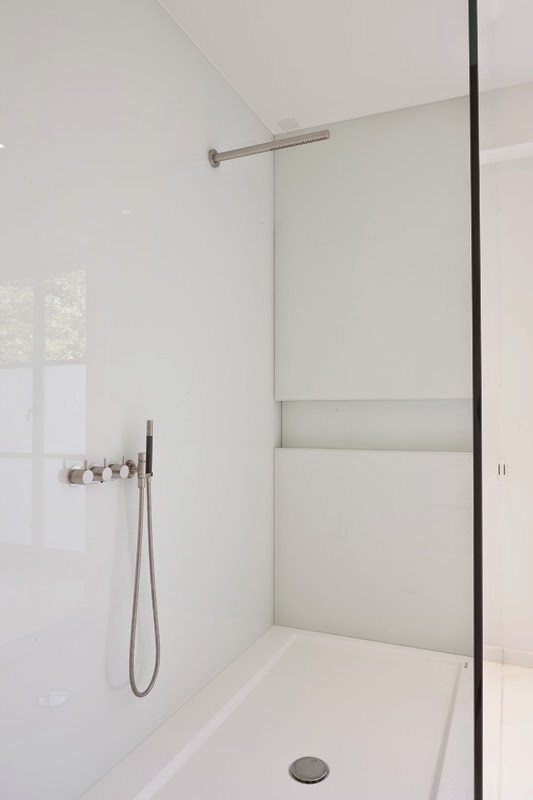 White glass panels are used to create shower walls.